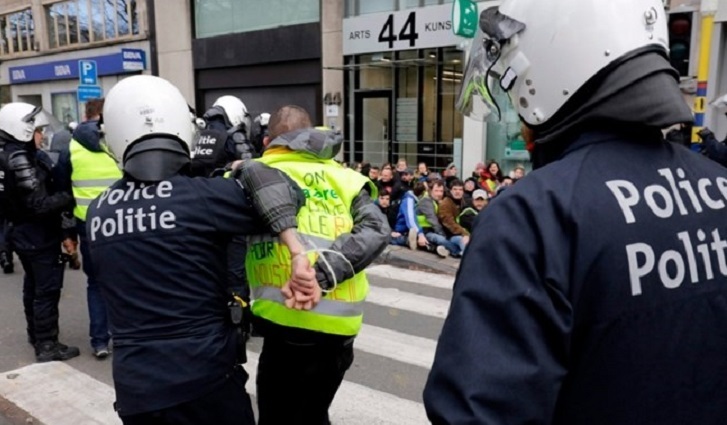 Police fired tear gas and water cannon and arrested around 400 people Saturday in the Belgian capital Brussels during a copycat "yellow vest" demonstration rocking neighbouring France. "A policeman was injured in the face. He was taken to hospital but his life is not in danger," Brussels police spokeswoman Ilse Van De Keere told AFP, adding that the protesters had hurled projectiles and paving stones. "There has been a certain amount of damage," she said, adding that the situation was now back to normal. About a thousand people took part in the rally and the police had to resort to teargas and water cannon to break up the demo, she said. According to Belga news agency, young protesters blocked a highway linking Brussels to the town of Rekkem in Flanders, near the French border. They also put up a barricade by the Franco-Belgian border close to Adinkerque, Belga said. The "yellow vest" movement in France started as a protest about planned fuel hikes but has since morphed into a mass protest against President Emmanuel Macron's policies and top-down style of governing.